Haven’t been scuba diving lately and want a quick refresher? The ReActivate™ program is the perfect way to brush up on your knowledge and skills from the PADI Open Water Diver Course before jumping back into the water. Whether you want a few reminders or need to go over the basics, ReActivate is personalized for you: You conveniently review scuba concepts on your tablet, mobile device or computer, then go diving with a PADI Professional. It’s quick and easy, and a good way to prepare for your next PADI course or get ready for a diving vacation. The best part is, divers who complete both the knowledge and in-water skill refresher receive a replacement certification card with a ReActivated date on it. If it’s been over six months since you’ve been diving and you’re planning a trip, you need to purchase the digital theory review from your dive center (who will give you an access code) or through the new PADI App. Once downloaded you will be presented with various realistic diving scenarios through text or a video and you will need to answer a multiple choice question on each scenario. Correct answers will progress you through the scenarios and incorrect responses will explain the correct answer and ask a similar question to ensure that you have understood. After completing all topics you complete the Re Activate Quick Review online, when answered correctly you will be presented with a certificate that you need to present to your dive center when you need to complete your water skills. 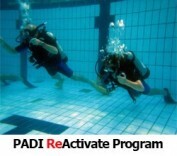 The Water Skills can be completed in Confined or Open Water with an Active PADI DiveMaster or Instructor. They will check your Log Book, ask what kind of diving you have done and if there are any specific skill you would like to practice. After this your Instructor will help you to practice and SCUBA skills you would like to practice. When this is all completed your Instructor will process your Re Activation where you can choose one of your SCUBA cert. cards (including specialty ratings) to be Re Activated. When this is done your new Re Activated card will be sent straight to your registered address in the post. When Can I Re Activate? Re Activate is available now in English, other languages will be available by the end of the first quarter 2015. By 1st October 2015 Re Activate will take over from the Scuba Review program.